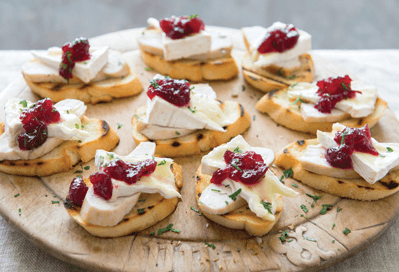 Finger food is always a welcome addition to any party, especially at Christmas! We’ve put together our favourite tried and tested canapé ideas, whether it’s your big Christmas get together or a relaxed family gathering, these recipes are ideal for the festive season and allow you more time to celebrate with family and friends and less time in the kitchen. First up, chicken and camembert crostini with Ballymaloe Cranberry Sauce. This recipe is easy to put together and the combination of flavours work wonderfully. It’s also delicious without chicken, if you’re short of time you can replace the crostini with crackers. Spanish omelette with Ballymaloe Relish, this is a great gluten free party food idea. This can be made hours in advance and will happily sit at room temperate. We sometimes double the recipe, it depends on how many are you’re expecting. When the Spanish omelette has cooled cut into 1 inch squares and top each piece with a little Ballymaloe Relish, add a sprinkling of finely chopped parsley and you have a very pretty canapé. Another vegetarian party food is our Ballymaloe Bruschettas . Preheat the oven to 230C, 450F, gas mark 6. Cut the bread into slices half an inch thick and brush one side with olive oil. Put this side facing down on a baking tray and put in the oven for 5 to 6 minutes until lightly brown at the edges. Meanwhile heat the Ballymaloe Italian Pasta Sauce in a saucepan, stirring until bubbling. Top the toasted bread with the sauce and finish with freshly grated parmesan and a rocket leaf or two. Always a favourite, we had to include homemade sausage rolls with Ballymaloe Relish. These can also be prepared in advance, and are delicious straight out of the oven. Try spreading a thin layer of Ballymaloe Relish on the puff pastry before adding the sausage mixture for an extra treat. Be warned, these never last long! We often put together boards with cheese, cold sliced meat, terrine, crackers and Ballymaloe Relish or Ballymaloe Jalapeno Pepper Relish and guests are more than happy to help themselves. Skewering cubed Gubeen chorizo pieces and your favourite cheddar onto cocktails sticks only takes seconds , place a small bowl of Ballymaloe Relish in the centre of your serving plate and arrange your chorizo and cheese skewers around it and your ready to party! We hope you enjoy these recipe ideas and wish you a very Happy Christmas from all of us at Ballymaloe Foods.